Retail sales in the EMU have fallen on hard times in December. EMU retail sales volumes fell by 1.6%, more than swamping the November gain and offsetting the gains for October and November together leaving the three-month growth rate at zero. Retail sales in the EMU are up by 0.6% over 12 months, down at an annual rate of -0.9% over six months, and dead flat over three months. Quarter-to-date, however (which is now for the complete Q4 period in 2018), shows retail sales volume rising at a 2.6% annualized pace. Motor vehicle (MV) registrations are a seriously volatile category that is showing a good deal of weakness. In the EU15-area, MV registrations fell by 7% in December, but that was after a 4.7% rise in November and a 21.4% gain in October. That explains the 95% annualized growth rate over three months. But that rate is absorbed and crunched into a -43% annual rate of sales implosion in the quarter-to-date (quarter average Q4 over quarter average Q3). Registrations are also down by 7.4% over 12 months. On balance, MV sales seem to be sputtering, but it is hard to nail down a trend due to this extreme volatility. Similarly, retail sales by country show a lot of weakness in the EMU. Among the seven European countries in the table, all but one (Portugal) logged a sales volume decline in December. Sales in Portugal, in fact, are surging and sales in Spain are gaining momentum. But apart from those two countries, all the others show a legacy of declines and all others have sales falling over three months on balance. Germany is especially weak with sales declines that become progressively deeper over shorter horizons. In the quarter-to-date period, that now refers to Q4 2018, four of seven countries show sales declines. There is a small (0.5%) annual rate gain in Germany and a modest (0.8%) annual rate gain in Denmark. Portugal logs a fired up 12.8% annualized sales gain in Q4 2018. Meanwhile, there are moderate-to-modest sales volume declines in Spain, the U.K., Norway, and Sweden in Q4 2018. Weakness in retail sales is mirroring the weakness in the Markit PMI readings. The PMIs have been showing weakness in manufacturing and service sector gauges. 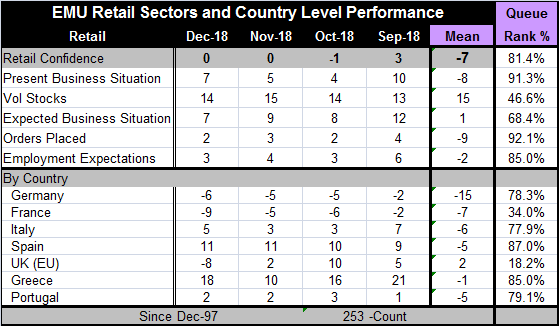 The EU Commission retail survey shows a retail sector in the EMU with an 81st percentile standing, a very strong reading for sector confidence. The present business situation has an even stronger 91st percentile standing. And while orders are still strong (92nd percentile standing), the expected business situation response has a more circumspect reading with a standing in its 68th percentile. That is still a solid positive (well above median) response, but it is short of the strength and confidence we see for other measures in retailing. However, employment expectations are still strong with an 85th percentile standing. The country by country readings dovetail with our results on retail sales as Spain's high 87th percentile reading and Portugal's 79th percentile readings are among the leaders in this presentation. Greece slips in with the strongest reading at an 85th percentile standing as it is finally getting some traction after years of austerity and falling sales. Italy has a surprising 77th percentile standing for retail despite its economic problems. The U.K. (18th percentile) and France (34th percentile) lag the other regions and both have below-median readings. The EMU data overall do not show much positive momentum in the retailing assessments. All readings are off their four-month highs. By country, Spain alone is on its four-month high and Portugal is not far off its four-month high. However, the U.K., France, and Germany are on clear four-month lows. Overall the retail sector in the EMU is following the same weakening trend we see in other European gauges. The consumer is getting sucked into the vortex of weakness. The strength we see in Southern European retail sales is not likely to be resistant to the weakness in the rest of the euro area.